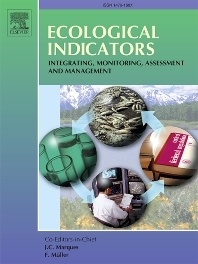 The ultimate aim of Ecological Indicators is to integrate the monitoring and assessment of ecological and environmental indicators with management practices. The journal provides a forum for the discussion of the applied scientific development and review of traditional indicator applications as well as for theoretical, modelling and quantitative approaches such as index development. Research into the following areas will be published. • All aspects of ecological and environmental indicators and indices. • New indicators, and new approaches and methods for indicator development, testing and use. • Development and modelling of indices, e.g. application of indicator suites across multiple scales and resources. • Analysis and research of resource, system- and scale-specific indicators. • Methods for integration of social and other valuation metrics for the production of scientifically rigorous and politically-relevant assessments using indicator-based monitoring and assessment programs. • Approaches on how research indicators can be transformed into direct application for management purposes. • Broader assessment objectives and methods, e.g. biodiversity, biological integrity, and sustainability, through the use of indicators. • Resource-specific indicators such as landscape, agroecosystems, forests ecosystems, aquatic ecosystems, wetlands, etc. <br /><br />Original research papers; <br />Review articles; <br />Special themed issues; <br />Short notes and case studies; <br />Viewpoints; <br />Letters to the Editor; <br />Book reviews.